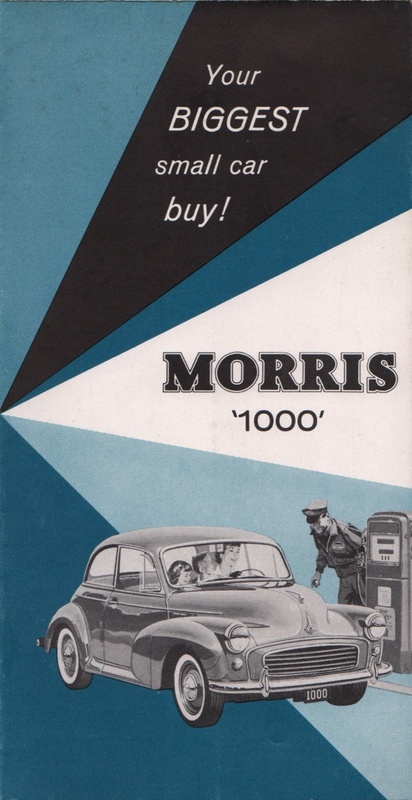 Sales brochure for the 1957 Morris 1000 with a 37bhp 4-cylinder. This brochure was printed in the USA. The colors are listed on the last pages as, 2-door sedan, 4-door sedan and convertible models are available in the following color combinations: Black with MG grey, red or green upholstery; Dark green with MG grey upholstery; Turquoise with MG grey upholstery; Cream with red upholstery; Sage green with MG grey or green upholstery; Birch grey with MG grey or red upholstery; Clarendon grey with MG grey or red upholstery. Convertible tops are available in maroon or grey according to body color. Station wagons are available in Black with red or green upholstery; Dark green with MG grey upholstery; Birch grey with red upholstery; Clarendon grey with red upholstery. Brochures are presented for research use only. Company marks, emblems, and designs are trademarks and/or service marks of Morris.